The most important driver of stock prices is earnings. 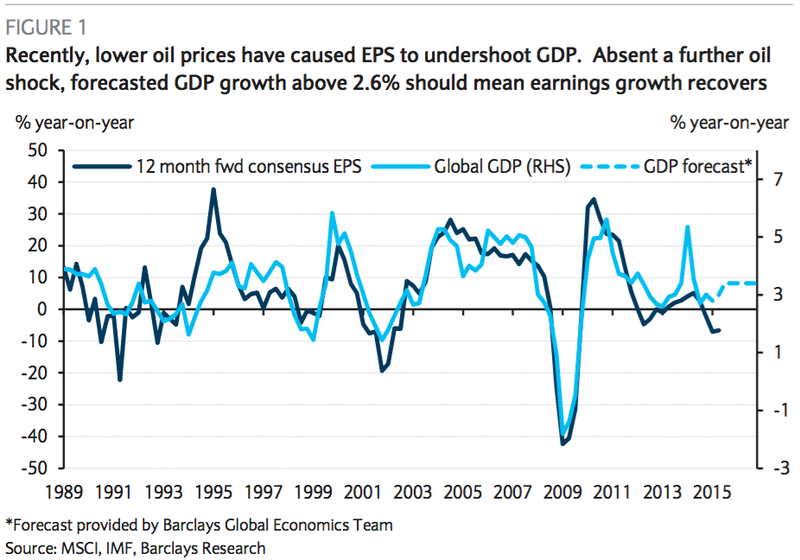 "Earnings hold the key," Barclays' Ian Scott writes. "The key to the outlook for global equities is earnings, with global valuations in line with historical averages, a supportive monetary policy backdrop, and very bearish sentiment, a major hit to [earnings per share] is the main risk for the market," Scott argued in a new note to clients. In the US, corporate earnings growth has been slowing for months. "It's amazing how forgiving the general commentary has been on profits and even the broad economy," Deutsche Bank's David Bianco said in an email to Business Insider. "Many seem to celebrate the absence of a recession. The labor market continues to tighten ... but other than some bright spots like auto and housing, growth is extremely weak with underlying drivers like productivity and investment disturbingly poor and S&P profits are not growing." Not only are earnings in the US not growing, but by many estimates, earnings are now contracting. Societe Generale's Andrew Lapthorne has been sounding the alarm on earnings for a while and reiterated this call in a note to clients on Monday. "The chart below shows the annual change in 12-month forward S&P 500 EPS expectations. This series is based on forward consensus expectations and therefore excludes many of the write-downs and exceptional items that are currently pushing down actual reported profits," Lapthorne noted. "It is more akin to operational profits and has never been this negative outside of a recession!" "US profits growth has never been this weak outside of a recession," Lapthorne said. This is particularly concerning as the Federal Reserve appears to be on the brink of hiking interest rates, which could put further pressure on profits. "Higher rates are always an incremental negative for the stock market," veteran market strategist Richard Bernstein wrote. "The probability of a bear market increases when the Fed increases rates faster than the improvement in earnings growth." "The Fed now risks being wrong footed, and the problem for the stock market today is the Fed is 'threatening' to raise interest rates at a time when S&P 500 earnings growth is actually negative ... We’ve been concerned for many months that the recipe for the much- anticipated correction could be the Fed hiking rates when earnings growth was negative." "This chart shows how unusual the past several years have been because the Fed did not raise rates as the profits cycle accelerated," Bernstein said. Bernstein attributes the recent market volatility to investors and traders discounting this, saying it's "easily explained by the unusual combination of tightening monetary policy and negative earnings growth." The analysts at FactSet observed that with stock prices falling, the changes in S&P 500 earnings estimates and prices are moving in the same direction for the first time since Q4 2012. For investors long the stock market, the question is how long will this negative trend in earnings last. "This marked the first time since Q4 2012 that both the bottom-up EPS estimate and the value of the index fell during the first two months of a quarter," FactSet said.